Amazon made headlines around the banking/fintech world this week following a WSJ story Monday about a rumored collaboration with Chase Bank and/or Capital One. The click-bait title, Next Up for Amazon: Checking Accounts (apparently revised from the title embedded in the hyperlink, “Are You Ready for an Amazon-branded Checking”) made it go viral in the United States, at least with news organizations. The facts were less exciting than the headline. Apparently the ecommerce giant issued an RFP last year seeking suppliers of a “hybrid” checking account aimed at younger and unbanked customers (it’s unclear whether that is a single segment “young and underbanked” or two segments, “young” and/or “underbanked”). And there was no indication that any new product was coming now, or ever. Teen accounts: Amazon allows teens to set up separate logins and make purchases from an allowance amount and/or request approval directly from parents (Source: Business Intelligence). The only major retail banking service missing, a stand-alone debit card (although you can already link a debit card to your Amazon account). Which I’m guessing is the core of the RFP mentioned by the Wall Street Journal. Update (13 Mar 2018): Bloomberg reports that Amazon is planning on launching a small business co-branded card with Chase, the issuer of Amazon’s consumer card. Bottom line: Amazon is already deeply involved in banking and payments, as are most major retailers. Gift cards, co-branded credit cards, and SMB credit products are already being used by millions of consumers. Adding a debit card and/or “hybrid checking account” isn’t going to make them any more menacing as a competitor. The prime concern for banks is whether Amazon can move payment volume from bank-issued credit cards, where the industry enjoys healthy profit margins, to debit/ACH with narrow-to-non-existent margins. Discussing bank and credit union blogs seems so last decade. While the hype has certainly died, so-called content marketing is still an effective strategy if done right (remember, less is more). 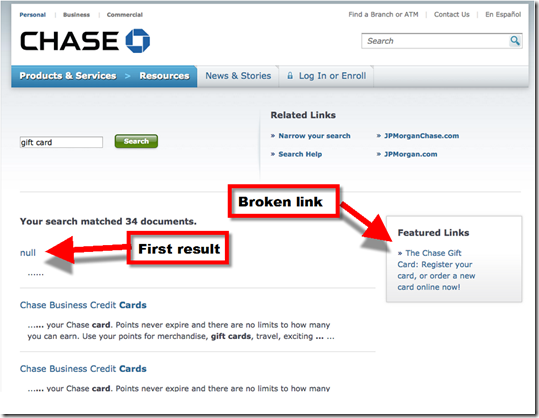 Chase has more data scientists and Ph.D.s at their disposal than NASA, and if the bank chooses to devote more than half its homepage to content marketing, you can bet they are seeing engagement, if not yet a measurable sales lift. (While I thought they went too far, cluttering their homepage, I yield to the data). However, the problem with most corporate-written “content” (not to pick on Chase) is that most of it – from any large organization that’s not a media company – is almost always super boring. Content-by-committee is just too watered down to be compelling to readers, who see hundreds, if not thousands, of more intriguing links and articles every week in Facebook, Twitter, ESPN, NY Times or the other big media outlets. The best FI-sponsored content sticks to local subjects that aren’t widely available in large media outlets. There are few financial institutions that have stuck to blogging over the long haul, but one that stands out is Arvest Bank. I’ve subscribed to its blog feed for many years, and I’ve found their content to be continually excellent. I’m not in their geographic footprint, so I don’t personally benefit from their insights. But as an outside observer, I think they provide a good mix of local interest material, personal as well as small biz financial advice, and simple updates on their products or holiday hours. I can’t write about content market without a shout-out to Tim McAlpine and the team at Currency Marketing who do some of the best work on the planet, for example, the Young & Free campaign aimed at 25-and-unders and its newest effort, That Money Thing. 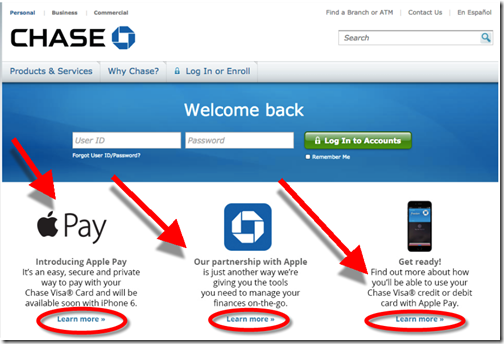 Chase unveiled a new homepage (on right above), the second in the past three years. While the first (on left above), unveiled in Oct 2012, was a massive rebuild, the latest is a more of a large remodel. I was not a huge fan of the 2012 version, so I’m glad to see the improvement, especially the downsizing of the page-dominating log-in area. The first impression is good and the overall look and feel supports the Chase brand. But I think other homepages (e.g., Umpqua Bank, Verity Credit Union or even Capital One) do a better job showcasing banking products as opposed to “lifestyle” content that Chase seems enamored with (see #5 below). However, website design is much more than the homepage, and Chase’s previous design is a top performer in Change Sciences overall 2014 website usability and conversion ratings. 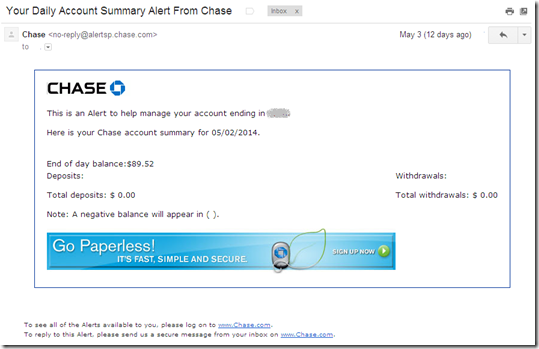 So clearly Chase knows how to convert their massive website traffic. I’m sure they will be closely following the metrics after the change and will tweak any under-performing areas. 1. Feel at home: Localized images personalize the site for returning visitors. 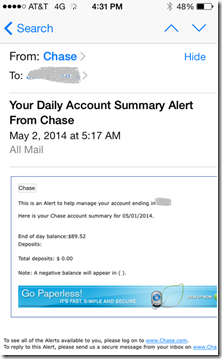 My take: This is a great feature brought over from Chase’s mobile app. Customized images are a nice and a relatively easy way to localize—still important in a country with 10,000 banks and credit unions, 99% of which are locally oriented. However, Chase’s implementation is a bit jarring. The eight images dizzily zoom right-to-left every 7 seconds and never stop. Luckily, they don’t begin until after you’ve been on page for 20+ seconds, so you can log in before the show begins. 2. 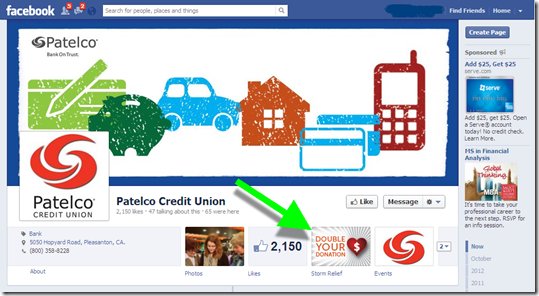 Take a scroll: As with any newsfeed, customers can scroll down the homepage and have access to relevant content. My take: Take a scroll is a clever bit of wordsmithing, but it’s a bit unusual to claim it as a benefit. That said, I do like the comparison to a newsfeed, a more modern concept generally not associated with banks. 3. Navigate with ease: The easy-access menu stays clearly in sight as customers scroll down the homepage. 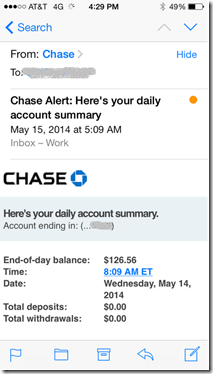 My take: Chase’s fixed navigation is a UI feature that’s important on longer pages. But is it smart to mimic the mobile UI so closely? A universal complaint about mobile websites is their inconsistent navigation compared to desktop websites where nav has become well standardized. Yes, the design looks cooler, like a ginormous iPhone screen, but does the aesthetic win come at the expense of usability? With those jumbo images flashing by every 7 seconds, you do not want to linger. There is also inconsistent navigation: The homepage uses the mobile approach while the inner pages have the older navigation—do we assume that’s temporary? 4. See the choices: Customers can find which checking accounts, credit cards or mortgages best fit their lifestyle. My take: Chase claims: “Customers can find which checking accounts, credit cards or mortgages best fit their lifestyle.” I’m pretty sure real people don’t think about their bank accounts that way, but what I believe the bank is saying here is that exposing readers to products within the “news and stories” section (see below) will lead to more sales. I have my doubts, and Chase can alter this quickly if the metrics aren’t supporting the tactic. 5. Learn from both experts and customers: News and Stories’ timely advice and insights move to a more prominent place. My take: Big brands have been toying with “content marketing” off and on for 20 years. I understand the bank’s desire to market this way, but with so many other credible sources of personal finance info, you just end up looking amateurish compared with the NY Times, CNN Money, not too mention the hundreds of personal finance blogs. And even if you pay Pulitzer prize-winning journalists to write original content, you cannot avoid the fact that the article is POSTED TO A BANK SITE. My advice, stick to facts, tutorials, and links to third-party resources. This week, digital poster child Square jumped into the plastic gift card market. Unlike many of its new endeavors, old-school cards were met with a decided lack of enthusiasm in the tech press (and my Twitter feed). Many recalled the company’s failed efforts with virtual gift cards (which I liked then, and still do). Most people in the tech press (and even more so in my Twitter feed) want their iPhone to handle all transactions, loyalty points, and payments. But that’s not quite how the world works yet. Even Starbucks, claiming 90% of all U.S. mobile payments (pre Apple Pay of course), just launched a major holiday plastic initiative (see below). The Square offering is compelling for its core small business clients. The cards are drop-dead simple. 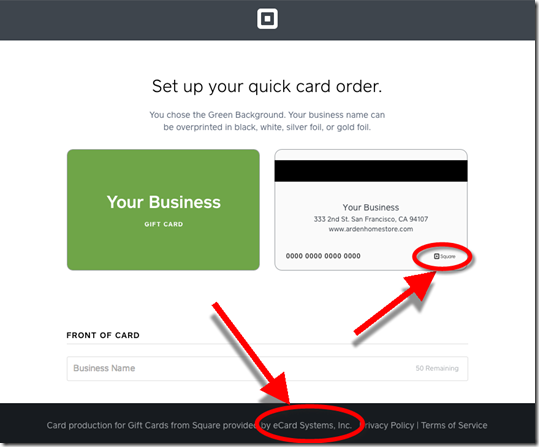 Merchants order from their Square dashboard which is powered by eCardSystems. Cards cost $1.50 per card with a minimum order of 125 and are shipped in 3 business days. Merchants load by swiping through Square’s POS dongle or Register, and users are good to go. The merchant receives the entire load amount immediately (less Square’s 2.9% cut). The cards are heavily merchant branded. The merchant’s name is printed on the front in a choice of fonts and colors and the merchant’s contact info is printed on the back. The card design can be one of 20 generic designs (see screenshot) or can be customized with any image uploaded by merchant (cost is the same, but minimum quantity rises to 500, and turnaround time is 15 business days, so almost too late for the 2014 holiday season). 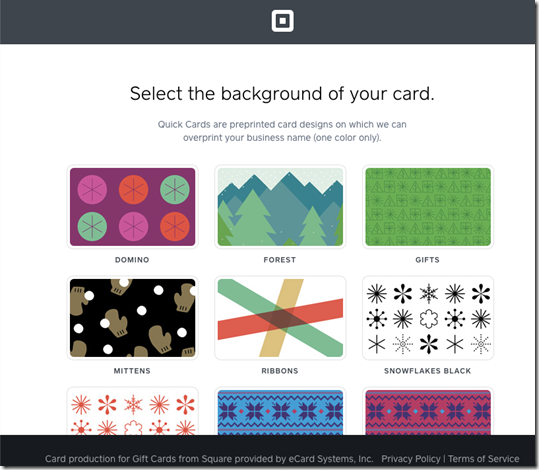 The only Square branding is a small logo, seen back-of-card, lower right (see top of post). 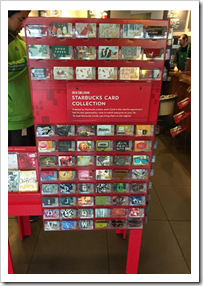 The cards are reloadable, so they can be used as a loyalty platform, with rewards based on load amount. For example, my favorite coffee shop adds an extra 10% of value for each load. One of the the Starbucks flagship stores is in my neighborhood, so we occasionally see merchandise being tested. So, I’m not sure if this over-the-top gift card display is in wide use (see its Nov 12 press release). But the Seattle U-Village main Starbucks has two of these massive display cases near the queue (the back side has the usual holiday beans and merchandise). Apparently, there are more than 100 different designs. It’s no surprise. Last year, the company reported that $1.4 billion was loaded onto cards during 4th quarter and an astonishing 1 out of every 8 U.S. adults received a Starbucks card. It looks like they are going for 1 in 7 this year. 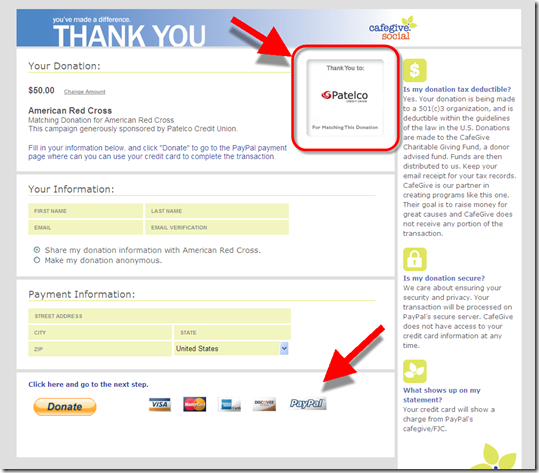 I’ve been following bank efforts in gift cards for 10 years and have found little exciting to report (see archives). While a few bursts of activity have occurred at holiday times the last few years (previous posts), banks seem content to let their customers pick up cards at Safeway. Even Chase, which has a great card that my son uses, and was the highest-rated big-bank card in Consumer Reports (Aug 2013, Prepaid Buying Guide), has zero merchandising for “gift cards” on its website (see third screenshot below). 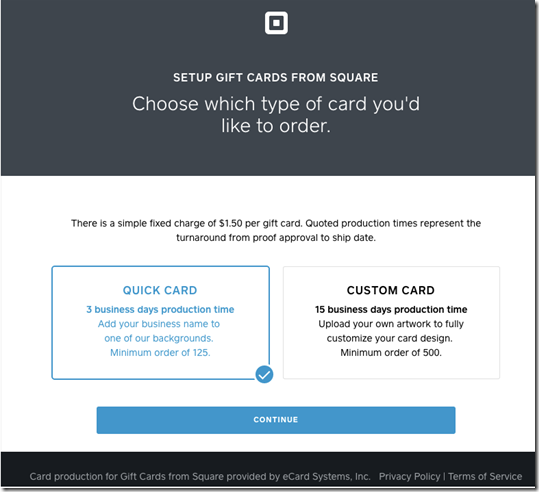 Few banks are going to emulate Square’s approach and build gift cards for acquiring clients. But I do see an opportunity to develop a retail gift card marketplace offering both plastic and virtual cards with distribution via online, mobile, in-branch and even ATM. It’s on my short list of ways FIs could turn a buck from their presence (see post). I’ll admit to being caught up in the hype. The 48 hours after Tim Cook revealed Apple’s long-rumored foray into payments were some of the most exciting times in fintech since the 1995 to 1997 period when most of the online “firsts” happened (see note 1). And we’re seeing more thoughtful fintech posts in the past week than we used to see in an entire year. Thanks especially to Tom Noyes, Cherian Abraham, Brian Roemmele, Celent’s Zilvinas Bareisis and finally today from Gonzo’s Steve Williams for helping me see beyond the hype. I can add little that hasn’t already been said to the discussion about NFC, payment ecosystems, or the future of mobile payments. Clearly, it marks a turning point for mobile payments and improved U.S. security, and the play-out will be fun to watch. The one area I haven’t seen covered: What does all this mean for the 10,000 U.S. banks and credit unions not on the 11-name list at launch (note 2)? Supposedly, there are 220,000 contactless terminals in the United States. But if you’ve ever tried to use one, you know that 200,000 of them are either not working or are buried behind beef jerky on the counter. This will change rapidly as merchants upgrade during the next few years. First, you need an iPhone 6, then you need to figure out how to use Apple’s Passbook program, log in to iTunes or take a picture of your card, successfully authorize it, enable TouchID and so on. Millions of early adopters will figure all that out, but then they won’t be able to find a working contactless terminal (see #1) and then they’ll forget all about it. Let’s do the math. Assume that a year from now there are 5 million Apple Pay active users (making at least one transaction per week) or 2.5% of U.S adults. 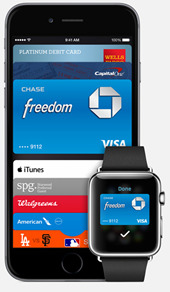 If you have 20,000 customers, that means 500 will be active users of Apple Pay. Most will be happy to use their existing Capital One, Citi, and other rewards credit cards for the transactions. Very few will care that your debit card doesn’t work on the system. Let’s say it’s around 25%. That means you have something like 125 customers who are disappointed with your mobile payment capabilities. If they like you otherwise, how many will move their checking account to get an Apple Pay-enabled version? While the number is probably zero, let’s say it’s 5% to 10%. That means you could lose 6 to 12 customers. Using the 80/20 rule, only one or two of them are profitable. Will it hurt to lose two profitable customers? Sure, but it’s not going to be on your top-10 or top-25 list of worries. Even if my math in #3 is way off, or you are concerned that you will take a material hit to the bottom line, or you just want to be part of Apple Pay, easy routes will undoubtably be built to get your cards enabled into Apple Pay. Maybe not in 2014 (or even 2015), but certainly within the next couple years. And even if I’m wrong and you are locked out of the iPhone indefinitely, you can create an Apple Pay poaching program where your customers make their charges on a bigco bank card, then you automatically pay those charges off and essentially transfer them to your customer’s checking account. So my final advice. If you have an employer (or spouse) that’s been reluctant to fund your iThings, now is the perfect time to do an upgrade (just don’t show them this post). 1. Or perhaps 1999 when Paypal/X.com made P2P payments happen or even 2005/2006 when Zopa/Prosper/LendingClub launched consumer credit exchanges. 2. See Apple Pay launch event clip here, complete with transcript. While I’m not a branch banking proponent, most of my experiences have been pleasant. But, I can’t remember a complex transaction or problem resolution that was handled "beyond my expectations." That said, the crew at Chase Bank (Wedgwood), treats us very well and even reads this blog (hi Ben), and that’s saying something. But the Chase branch did beat expectation this past Saturday. My son was leaving on a school trip that night. I wanted to send him with a prepaid card for unforeseen travel expenses. I had a collection of cards in a drawer that I’d tested over the years. But for a variety of reasons they were all unusable (expired, dormant or just not working). So, I figured I’d just buy him a throwaway card at Safeway. But I really wanted one that was easy to reload online in case he ran in to a cash jam (note 2). Since there is a Chase branch next to my usual Saturday coffee stop, I dropped by on the off-chance they could issue them on the spot. I was shocked pleasantly surprised to find out the bank’s relatively new Liquid card was in stock and the opening process took less than 10 minutes, faster than a trip to Safeway. And the card was immediately linked to my online banking where I could transfer funds into the card. It was the ultimate in convenience: no new passwords to remember, new UI’s to traverse, or complex reloading procedures to figure out. The card does have a $4.95 monthly fee, but with no reloading costs, I think that’s fair (note 1). Bottom line: While I can’t speak for the overall ROI of the branch on Saturday mornings (I was the only person there during my 10-15 min visit at 9:30 AM April 13), I was a very happy customer, who added another service to my Chase banking relationship, and created positive word of mouth (note 3). 1. After I’d already committed to buying, I found out the monthly fee would be waived based on our business relationship. But that wasn’t part of my purchasing decision. 2. My son has apparently lost the card before I could even publish the blog post. So I will soon be experiencing Chase’s lost card customer service. 3. Disclosure: We do not accept blog advertising or affiliate deals, so this is not a paid endorsement. 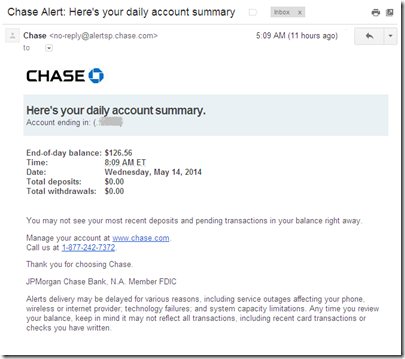 Chase is a Finovate customer (newsletter, event tickets) like many of the companies mentioned here. 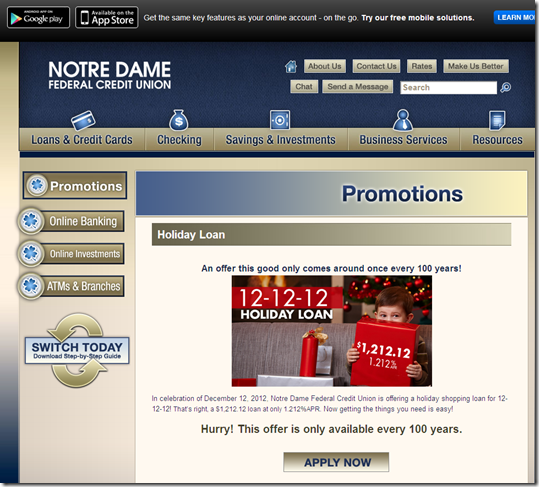 Last year, we were disappointed at the lack of promotions on double-triple-digit day, finding just a single promo 11/11/11 promotion (see our post on Notre Dame FCU). But it was Veteran’s Day and most U.S. banks were closed. 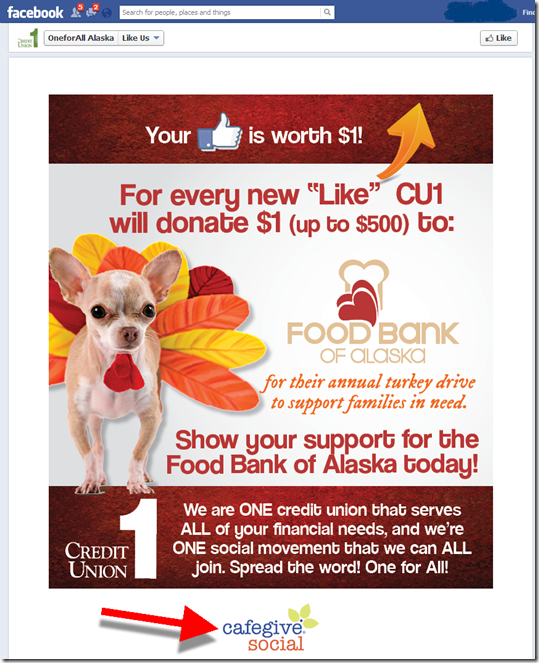 This year, 12/12/12 falls at a much better time in the promo calendar, and FI marketers responded, at least on the credit union side. 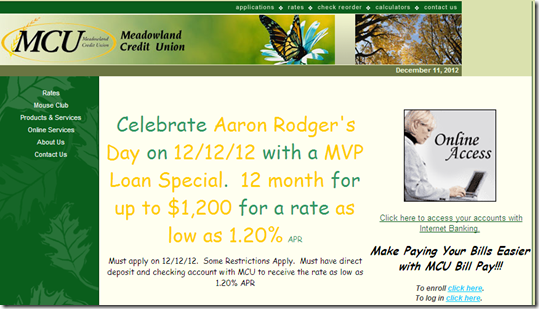 In the first five pages of Google results we found 15 CU promotions, most offering 12-month, $1,200 loans. 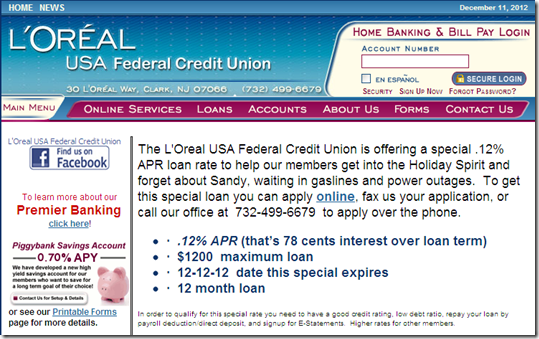 However, it turns out that “12/12/12 loans” are regular December fare at a number of credit unions. Only four of the 15 were focused on the once-in-a-hundred-years date, one on the deposit side and three low-rate loan specials (note 1). The standout deal? A 0.12% APR on a $1,200 loan from L’Oreal USA FCU. No banks seem to be joining the fun. 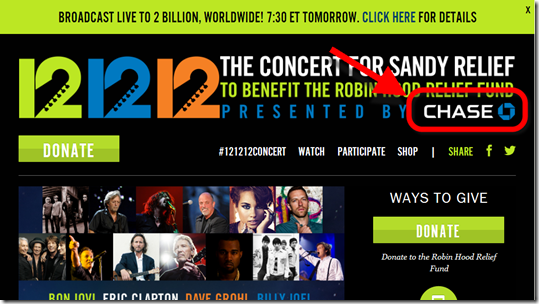 Although Chase was promoting its sponsorship of the 12/12/12 Sandy benefit concert with an AdWords buy on Google yesterday (screenshot 5). 1. 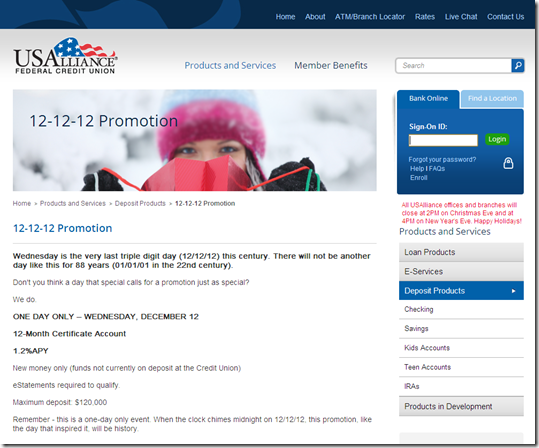 We searched for “12/12/12 promotion credit union” and found many entries. The same search with “bank” instead of “credit union” turned about nothing (at least through the first dozen pages of results). 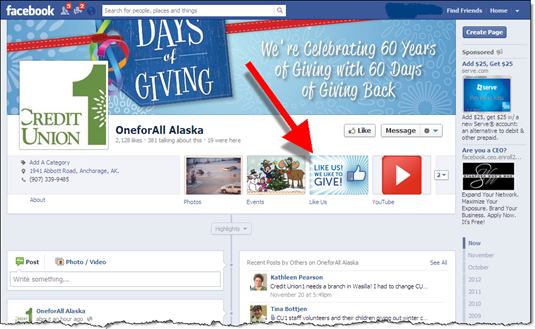 The response to Chase Bank’s Community Giving Facebook campaign has been remarkable (except for a few glitches). It’s one of the top social media successes across all industries (see previous post). If you are looking to do something similar this holiday season (or more likely in 2013), you may want to outsource the tech to a specialist who can help maximize the power of social networks while keeping you from free from any controversy. There are a number of companies that can help you create Facebook apps. For example, we were recently briefed by a newcomer that has been getting some traction recently with a large U.S. bank and several credit unions, CafeGive. US Bank ran a successful program earlier this year in partnership with the Oregon State Activities Association. In a strategy reminiscent of Chase Community Giving, the bank invited the community to nominate and vote (see inset; case study). 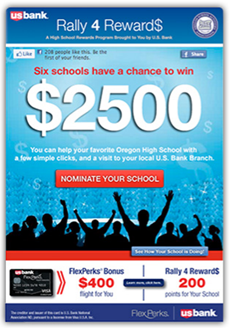 Six winning high schools each received $2,500. The bank is expected to run the promotion again in 2013. 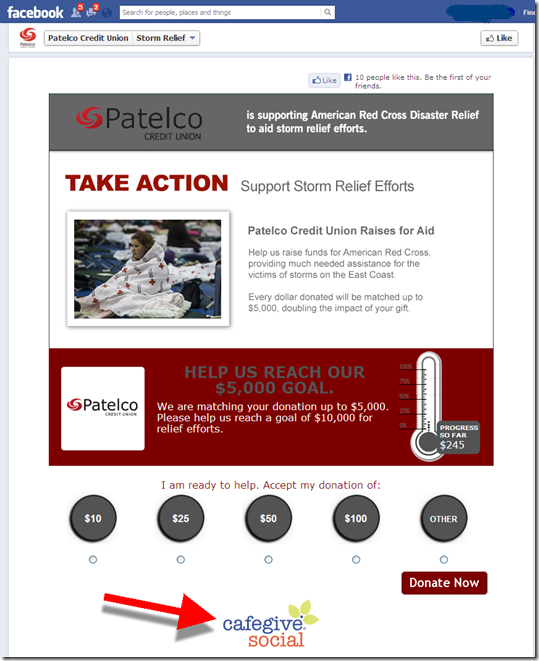 Patelco Credit Union is using a simple fundraising app they were able to deploy within a few days after Hurricane Sandy hit the Northeast USA (see screenshot 1 – 4). The app includes a progress bar, updated in real-time, showing progress towards the goal. 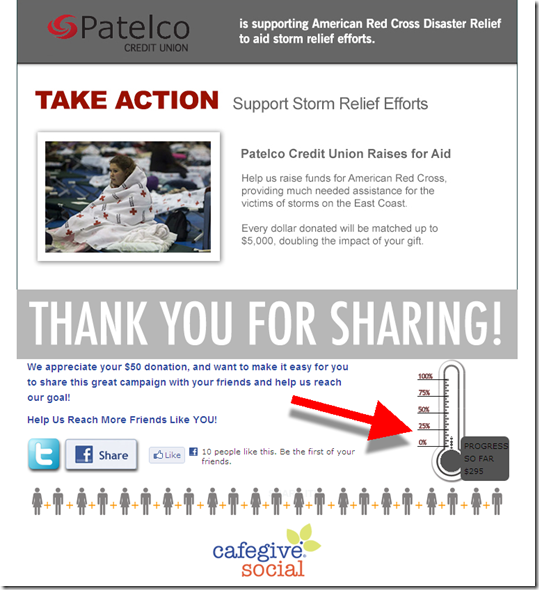 Many marketers have mixed feelings about cause marketing. On the one hand you are bragging about how generous you are while at the same time convincing your CFO that there is a positive ROI. But regardless of your motives, you want to get as much bang for your buck. Outsourcing the plumbing makes a lot of sense for these less-frequent programs. Bottom line: It’s win-win. You do the right thing and it improves your brand image and boosts employee morale. 1. According to CafeGive Founder Sandra Morris, consumers gravitate towards brands with a conscious. She cites a survey that showed the top-3 reasons millennials gave for using a brand were: a) convenience, b) online services, and c) give back.